I’ve written extensively about the importance of syndication to framing a community for a long time on this blog. In fact, recently I’ve even shied away from writing about it because I feel I’ve beaten that horse to death. Nonetheless, I can’t quit you RSS. So, let’s do that dance one more time. Last year, just about this time, I wrote about how UMW’s main webpage is poised to become a syndication hub that allows sites all over umw.edu to syndicate content from a wide array of relevant sites. At the same time Curtiss Grymala and Cathy Derecki rolled out the ability for faculty profile pages to aggregate their work from a wide range of social media sites. A year later both these features are that much more important as we start get faculty and students alike to manage and control their web presence on their own domain with Domain of One’s Own. After writing my last post yesterday about how a somewhat simple, easy solution that allows faculty to syndicate students’ work into a course site is essential to making the syndication hub work, I started to reflect again on the umw.edu setup as syndication laboratory. Almost three years ago the Eagle Eye site was created so that faculty and staff could submit relevant news, announcements, and professional notes to the community at large. What’s more, every Thursday an email-friendly version went out to the entire community. I wrote about this setup over a year ago, commenting on how it was an example of how a model like this can help the UMW community get a “birds-eye view” of what’s happening on campus. And then I realized… like I was shot… like I was shot with a diamond… a diamond bullet right through my forehead. And I thought, my God… the genius of that! 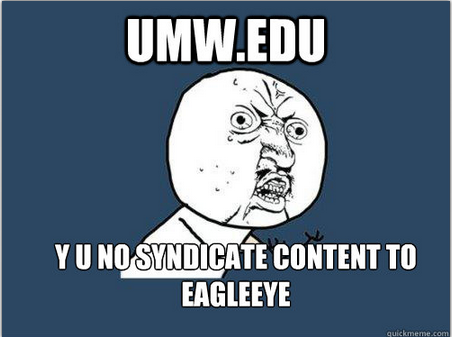 Why aren’t we marrying EagleEye and the syndication hub for umw.edu? Fact is, EagleEye has already been ported off UMW Blogs and is now officially part of umw.edu. Given that, how hard would it be to have anyone submitting news, announcements, or professional notes to EagleEye simply publish it directly on their respective department site with a specific tag? 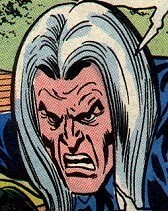 If that were the case, which seems logical enough, we tell people to tag any post that they want featured in Eagle Eye with the tag eagleeye. After that, any post within the UMW Webpage tagged eagleeye will syndicate directly into EagleEye as a draft that can then be vetted, edited and published for the Thursday email. Think about it, a lot of people/departments are regularly posting to Eagle Eye already. With over 3500 posts in the last three years, that’s an average of 3 posts a day, everyday for three years. That’s a lot of solid, relevant content that is specifically focused on our community. Now, what if we allowed everyone in the community to post that relevant content on their departmental site with the knowledge that it will be reproduced seamlessly to EagleEye if they use a certain tag? It’s the Udellian dream of making things easier through syndication come true, what’s more it makes the UMW webpage that much richer because as of now departments and/or individuals are not reproducing the posts they make on EagleEye on their departmental webpages (DTLT is the only one doing this, and as of now we have to do that manually by reproducing the post because the feeds on EagleEye are balking, such as http://eagleeye.umw.edu/tag/dtlt/feed). I don’t know if this makes any sense at all, but I guess I need to keep on knocking my head against the syndication wall because I don’t have much else. But even more than that, if we like the open, distributed web, this is the best way at it without trying to package the whole thing into an app. This entry was posted in rss, tags, umw.edu and tagged eagleeye, feed, rss, syndication, syndication-oriented architecture, umw.edu. Bookmark the permalink.